Defenders of The Last Stand is a post apocalyptic adventure game by Richard Launius (Arkham Horror, Run Fight or Die, Defenders of the Realm) for 1-5 players set in the Western United States more than 50 years after nuclear war. Players take on the roles of Defenders of the last known haven for humanity, called The Last Stand. Four outside clan leaders, along with their followers, advance toward the town, and players work cooperatively to defend The Last Stand. 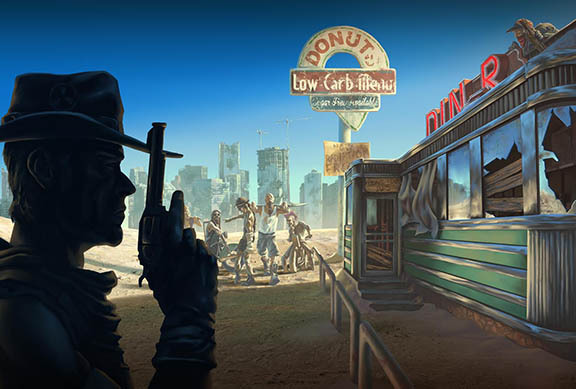 Menacing mutants also roam the desert threatening the city's survival. The game will introduce player character mutations - your character can mutate from travel into irradiated areas. Gameplay will consist of both elements of adventure and conflict resolution, and Defenders of the Last Stand will come loaded with miniatures, including three large sculpted miniatures of the invading Clan leaders as well as their minions - sculpted by Chad Hoverter. The four warrior clans include raiders on bikes and in cars, mutated humans who ride large beasts, techno-savvy yet criminally insane youths, and a large winged creature so mutated that he has lost all traces of his old humanity. Add a Review for "Defenders of the Last Stand"